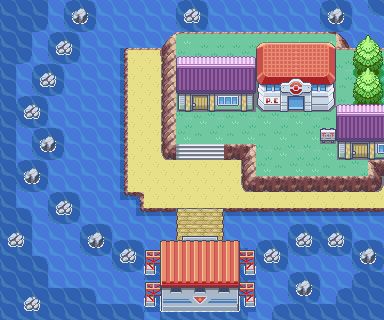 Five Island is the final home of Team Rocket. You should prepare yourself for a final confrontation with these nefarious group!!! But after you are done, don't leave just yet, as riches soon await you! Five Island appears to show nothing worthy of attention at first sight. There isn't even a Poke Mart in sight! Despite this humble appearance, Five Island is in fact, one of the most exciting Sevii Islands around. If you head north, you'll encounter areas rich with trainers that will fill your coffers with lots of money and exp. However, it's best to head east first for a final battle with Team Rocket! Advance through the small grass maze and clear out the Rockets around. You can now enter the Warehouse, as you now should have both passwords ("Goldeen need log" and "Yes, nah Chansey"). Before you go in, be sure to collect the two items from the area! This warehouse holds the final remnants of Team Rocket. The maze holds a lot of goodies inside, so take your time in exploring it and find them all, including TM36 Sludge Bomb!!! Tackle the Team Rocket members, and once you beat the Admin trainers, they will take a look at your Earth Badge and realize that the only way you could have acquired is by beating Giovanni. Team Rocket is now fully disbanded and you can now fight that miserable scientist who stole the Sapphire back in Dotted Cave. Take him out so you can reacquire the precious gem and you will finally be able to end your quest for Celio!!! Refrain from heading back just yet. There is more to discover in the Sevii Islands region, including some truly powerful Pokemon! You'll find Memorial Pillar by surfing east from Five Island Meadow. 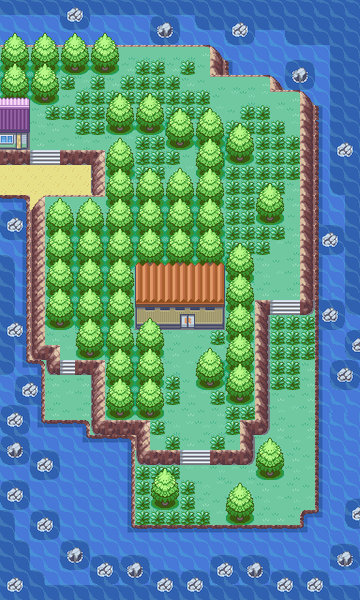 You'll first reach a long island filled with trainers and some hidden items. If you surf south, you'll reach a small landing with a big statue. This huge rock is in fact a memorial to a trainer's Onix, Tectonix. If you leave a Lemonade at the memorial, its trainer will give you TM42 Facade. There's also a Metal Coat on the left. After you're done, return to Five Island Town. If you Surf north from Five Island Town, you will enter the Water Labyrinth. This is a water maze that you could easily bypass by heading north, towards Resort Gorgeous. Refrain from this for the moment and instead head west towards the small beach. You'll find an old man on the land. Talk to him, and after examining the friendship level of your first Pokemon he'll give you an Egg, that once hatched will yield Togepi!!! Be aware that the Egg is not an item, it is technically a Pokemon, and in order to receive it you must have an empty spot in your party. Now you can head north. Resort Gorgeous & Lost Cave. Northeast of the Water Labyrinth lies the Resort Gorgeous zone. 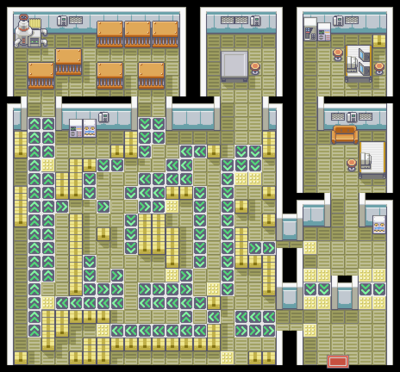 True to its name, this zone is home to some of the richest trainers in Kanto. This area is notable for its Lady trainers, who can become excellent sources of income. Upon arriving to the resort, you'll find that the house in the middle of the island will be empty. This is only temporary though, as its owner is currently lost within the properly named Lost Cave. Once you rescue her, Lady Selphie will take residence within the house and request (more like demand) that you show her a particular Pokemon. If you do so before walking 250 steps, Selphie's butler will reward you with an exciting item, which may even be the rare Luxury Ball. Additionally, both Lady trainers standing on the beach have Pokemon that are holding Nuggets or Stardust, and will also hand over close to 10,000 per fight. Keep this area in mind if you find yourself short on money. Simply use VS Seeker with the Lady trainers and in combination with the Amulet Coin, and a couple of Pokemon that know Thief or Covet, you could make close to 50,000 with only two easy challenges! This is a confusing cave filled with fog, and exits that never seem to go where you want to go. Lady Selphie is lost here and you need to "rescue" her. And by that I mean battle her so she goes home. There's a pattern to the cave. The path to reach Lady Selphie is actually pointed out by the number of rocks in the room. The number of rocks actually refers to the position in a clock, so three rocks is 3 o'clock, so you would need to head west, and so forth. If you head in the opposite direction to the clue, you will eventually reach an item. But if you don't want to think it through, just follow this table to reach your objective. Beat Lady Selphie's two Persians to get her to go home. Mind you, this is the only time you will get to battle her, so come prepared with the Amulet Coin and a couple of Pokemon that know Thief, so you can reap more rewards from battling her! After you are done collecting the items, head to Seven Island for your next challenge! Hoppip is yet another Johto Pokemon with an unusual type combination. A Flying/Grass type, Hoppip is actually available all over the Five Island zones, even while Surfing!! Hoppip has great speed stats, and its type combination can lead to new and unusual move combinations. Unfortunately, Hoppip's other stats are quite low, its learnset is mediocre at best, and it cannot even learn Fly. Best leave Hoppip in your PC. Hoppip evolves to Jumpluff at level 27. Fans of the anime can easily recognize Togepi. In this generation, Togepi is a Normal type Pokemon that must be hatched to be obtained. Togepi can only shine once it evolves to Togetic by increasing its friendship levels. Once it evolves, Togetic is granted powerful Defense, Spc Atk and Spc Def stats. Its moveset is filled with mostly support moves, such as Wish, and Follow Me. Togetic makes a good wall Pokemon, but you'll probably have to use some TM's on it to increase its versatility. Murkrow, exclusive to Fire Red, adds yet another strange bird to the game. As a Dark/Flying Pokemon, it carries decent Atack, Spc Atk and Speed stats. Murkrow is a decent choice if you wish to change your current Flying Pokemon, as it is one of the few Dark choices in FireRed, and it is capable of learning Faint Attack by level up, as well as some decent moves from TM's. Misdreavus, exclusive to LeafGreen, is another addition to the very small Ghost type group in this Generation. Misdreavus provides a benefit absent on the other Ghost Pokemon you've encountered before. Misdreavus is a pure Ghost type, unlike the Gastly group, and so it is more resistant to Psychic moves that have previously been so difficult to counter up to this point. If you want to use Misdreavus in your team, you'll have to teach it some TM's, including Psychic and Shadow Ball. This page was last edited on 28 June 2018, at 22:59. This page has been accessed 219,748 times.